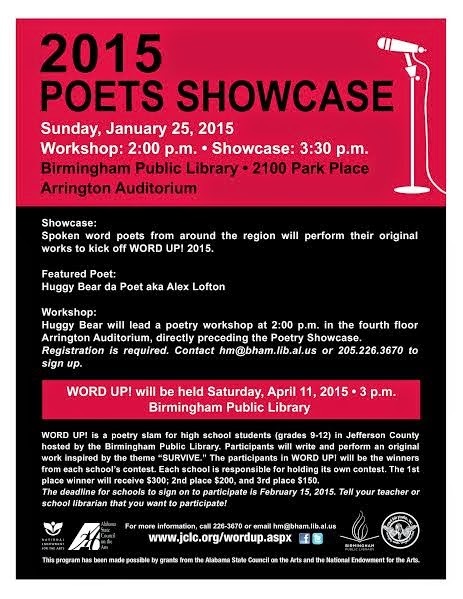 This coming Sunday, January 25, at 3:30 pm, we'll host a Poets Showcase featuring some of our area's finest spoken word poets. The headliner is Huggy Bear Da Poet from Mobile. At 2:00 pm, Huggy Bear will lead a poetry workshop for teens (12-18 years old). Registration is preferred; call 226-3671 or e-mail hm@bham.lib.al.us. Walk-ins are welcome as space allows.